View the Volunteer Voice Online! “Whether you’re an annual or perennial inour volunteer program,” says Palatine Park District Volunteer Coordinator Alissa DePue, “we appreciate the time, talents, and energy you provide.” The District is proud to offer this new quarterly newsletter that acknowledges the many individuals who donate their time to make a difference in the Palatine community. This quarter’s Volunteer Voice newsletter consists of an “In the News” section that highlights District volunteer coverage in local papers. The second page features several photos where volunteers were an essential part of our summer community events success. Other sections include “Creating Opportunities” that provides details on an up and coming volunteer programs, as well as a “Student Section” that demonstrates how volunteer experience helps enhance college and scholarship applications and obtaining your first job. 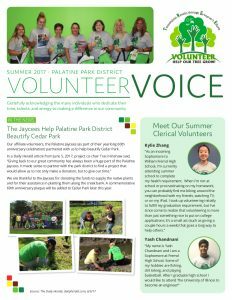 For more information about volunteering with Palatine Park District, visit our Volunteer Opportunities section, or contact Volunteer Coordinator Alissa DePue at 847.496.6212 or adepue@palatineparks.org.